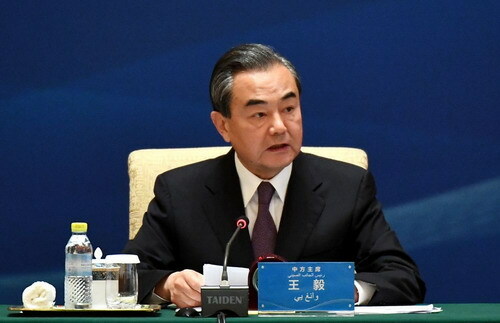 On July 10, 2018, State Councillor and Foreign Minister Wang Yi presided over the 8th Ministerial Meeting of the China-Arab States Cooperation Forum in Beijing. Wang Yi pointed out in his speech that the situation in the Middle East has come to a crossroad again. Today, President Xi Jinping pointed out in his speech at the opening ceremony that since peace, reform and development are common needs of various countries in the Middle East while stability, peace and happiness are common pursuits of people in the region, all parties should work together to promote the Middle East to break a new path of comprehensive rejuvenation. Therefore, China is willing to make joint efforts with the Arab side to march on the path and make it a successful path. Wang Yi expressed that peace is the most much-needed public product in the countries in the Middle East and development is the strongest desire of people in the region. We should firmly seize the greatest biggest common divisor to create preconditions for development with greater efforts for peace and let more development and cooperation provide dynamic sources for peace, thus forging a virtuous cycle in which peace and development are mutually coordinated and promoted. Wang Yi expressed that as Arab states are true protagonists in the Middle East affairs, they should and need to play a more important role in the Middle East affairs. Any regional arrangement should respect the interests and appeals of Arab nation. As a good friend of Arab states and a permanent member of the United Nations Security Council, China is willing to, together with Arab states, become the builder of peace, facilitator of stability and participator of the development in the Middle East.